Welcome to the information page for the listening bench installed in Burnham-on-Crouch, Essex. The bench features clips that reflect the key parts of the town’s heritage, particularly due to its location on the River Crouch. The bench is installed on West Quay, near the entrance to Riverside Park and opposite some houseboats. The bench has been put together by a group of local volunteers, with the support of Burnham-on-Crouch Town Council and Maldon District Council. 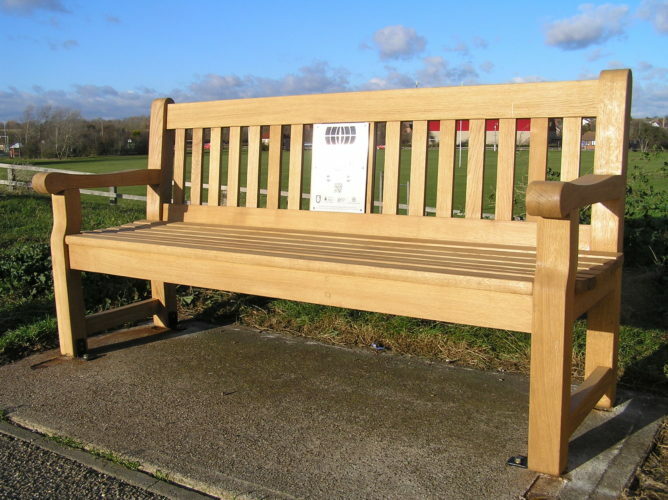 In future, the bench will be maintained by the Friends of the Listening Bench (click for more information). Because Burnham-on-Crouch was not as badly affected by the devastating floods of January 1953 as some areas, the town could play a vital role in providing a rescue centre, particularly to refugees from Canvey Island. This clip from a BBC Essex piece gives local memories of that night (SA 1/313/1). Herbert Hawes describes oyster fishing in Burnham-on-Crouch in the early twentieth century (SA 5/364/1), then Hilda Hart describes her father’s life as an oysterman (SA 29/1/1). Elizabeth Cooke shares her memories of local regattas, and how their popularity changed over the years (SA 5/388/1). George Taylor describes the living conditions when he was growing up in Burnham in the early twentieth century, and when he first started work (SA 5/381/1); then Norah Cole tells a story of her parents’ generosity to those in need (SA 29/13/1). Olive ‘Pansy’ Read recalls her school days in the Clock Tower, including prolonged illness (SA 29/11/1); then Harold Bigmore describes playing with skipping ropes and iron hoops (SA 29/3/1). Eloise Warwick Smith describes how the Women’s Voluntary Service started in Burnham, and their contributions to the war effort (SA 5/376/1).